I am so glad you are here, today! 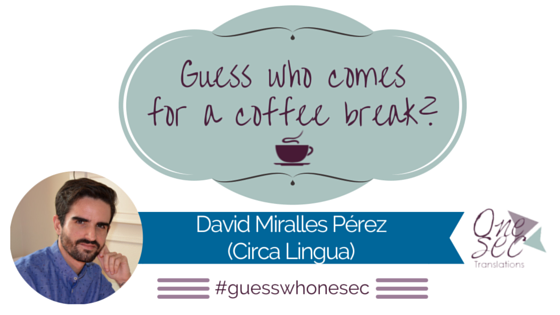 Let me introduce my e-friend and colleague David to you! Hi, David! Welcome to my coffeece! Secondly, let me explain you what we are going to do: I am going to ask you six sets plus a Bonus Qs section of questions covering your profile as a human being and a very kind and bright soul. (That’s exactly what I think about you!) Today, you are going to answer the firts three sets, then on Thursday the remainder of them. We are going to discover more about your true self and what lies behind the professional. ▷ My full name is David Miralles Pérez. I have no second name, but I do have two surnames! ▷ The 22nd January. Almost there again! ▷ Blue! The perks of having lived close to the sea during my whole life! ▷ So many things, it’s crazy! Haha. When I was very little I wanted to become a painter. I spent my days painting everything! Then I move on and wanted to become a teacher because I was very fond of my teachers at my nursery. Later on I discover English and loved to learn a new languages, so decided that I wanted to become an English teacher. But during high school, I thought that what I liked is to do practical things with the languages that I was learning instead of studying literature (which I love, but not as a career). This is how I discover the degree in translation and interpreting and didn’t hesitate to go for it!. ▷ I absolutely love animals. The thing is that I was allergic when I was little so I never had a pet. However, now I share a flat with a flatmate and two cats of her, which I adore! ▷ Both! And loads of them all! Haha. If I had to choose, then I think I’d opt for coffee. With no sugar and a bit of milk, please! ▷ I’m really making an effort to be a day person. But deep inside me, I must admit that I’m night owl! ▷ Sea! I’ve been living close to the sea during my whole life and it’s one of the things I appreciate the most. But I love hiking, so I do like the odd mountain every now an then. (Especially since I moved to Scotland!). ▷ No, not really. And it’s something that I regret because I’ve always wanted to play the violin. Maybe one day when I’ve got more time, I’ll start learning how to play it! ▷ My camera! I love photography and when I’m travelling, my camera is like my wee baby! And I must confess that I can’t leave home without my iPhone. It may seem a bit sad, I know, but when you’re running your own business, everything needs to be under control, and when I’m out of the office, my iPhone is a lifesaver for this purpose! ▷ You’re going to love this, Chiara! Italian food is absolutely the best! I eat a lot of pasta and I’m of the opinion that it’s never too much! When I went to Italy and went for my first aperitivo, I discover a new whole world of possibilities. Hahaha. I also love Greek food and I’m starting to be a bit addicted to Indian food as well! ▷ I like cooking and I’ve been cooking for myself since I was 18 and I’m still alive, so that must be a good sign! Haha. I especially like baking. One of my specialties is tiramisu. I’ve been told that my moussaka isn’t bad at all either! ▷ Sporty when work and uni give me a break. I’ve been always gone to the gym. Now I don’t have the time to do it, but I’ll join one as soon as I’m done with uni. I miss it! ▷ Monopoly! No one can beat me! Haha. ▷ I used to be. But it was something that I sacrificed when I left highschool. ▷ Without any doubt, Final Fantasy. All of them, especially VIII. You are such a funny, smart guy, David! I knew it! Hahaha Thank you, your lively personality pops out of your words and I would love to chat with you for a little while more, but out time is up for today! Don’t worry, this is your week, so… Hold on, we will be back on Thursday!